Duratec Elements is only suitable for coastal environments >10m from the high tide and is NOT suitable in strongly acidic environments so PH must be >5. Please refer to the ‘Interior and exterior environments close to liquids other than the sea’ section for warranty implications for in such environments. *Only Dulux Accredited Powder Coaters are able to issue our Dulux Alumi Shield™ and Steel Shield™ warranties after demonstrating their capability to meet stringent quality conditions and international standards. **The product is designed to reduce the visible mar and scuffing that can happen during transportation, fabrication, onsite during construction and service life when compared to smooth powder coat finishes. Developed primarily for use on extruded aluminium, including window and door joinery, and extruded aluminium panel work on class 1 & 10 residential buildings and on class 2-9 commercial buildings under the Australian Building Code and class. An etch rate of >1gm/m2 , is recommended for Duratec Elements projects greater than 100 metres from the coastline, but etch rate advice from pre-treatment suppliers should be taken into consideration. An etch rate of >2gm/m2 is recommended for all Duratec Elements projects between 10 and 100 metres from the coastline, but etch rate advice from pre-treatment suppliers should be taken into consideration. Final rinse water run-off from the extrusion shall have conductivity of less than 30 micro Siemens/cm. 2. Wash with fresh potable water and ensure that all soluble salts are removed in accordance with AS 3894.6 methods A&D. 6. The steel to be stored in an area which is clean and dry. 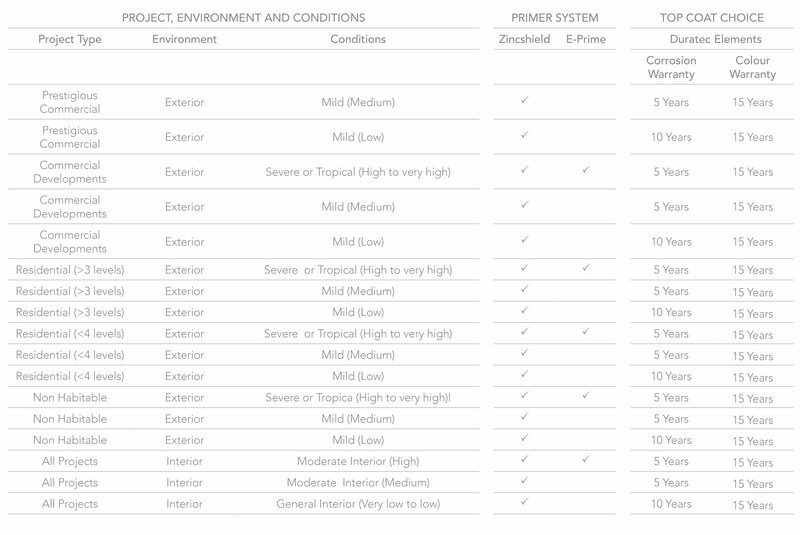 Use the following table to help identify where Duratec Elements can be applied on aluminium projects, the system required and the Dulux Alumi Shield™ warranty level available. Refer to the conditions information to determine the environment that your project will be exposed to. a. Interior: General Interior conditions (E-Prime base coat not mandatory); Moderate Interior (E-Prime base coat mandatory). b. Exterior: Mild (E-Prime base coat not mandatory); Severe and tropical: (E-Prime basecoat mandatory). For more information about specifications on perforated aluminium please click here. Use the following table to help identify where Duratec Elements can be applied on steel projects, the system required and the Dulux Steel Shield™ warranty level available. Refer to the conditions information to determine the environment that your project will be exposed to. Please refer to Interior and exterior environments close to liquids for warranty implications where powder coatings may be in close proximity to liquids other than the sea..
Use the following table which references AS4312 (atmospheric corrosivity zones in Australia) and AS3715 (Metal Finishing – Thermoset powder coatings for architectural applications of aluminium and aluminium alloys) to define the environmental conditions of your project. 1. Corrosion rate is for uncoated steel and is for reference to Steel Shield warranty environments. 1 Please note chemically treated water includes antimicrobial treatments, e.g. in pools, anti-corrosive chemicals, and soapy water in bathrooms and showers. ● Where indicated Steel Shield™ and Alumi Shield™ warranties are available on areas >than 2m from the liquid (ie outside the splash zone). Where indicated Steel Shield™ and Alumi Shield™ warranties are available any distance from the liquid. Steel Shield and Alumi Shield warranties are only available when applied by a Dulux Accredited Powder Coater to the warranty specification on recommended project types and conditions. All Dulux powder product are NOT suitable in strongly acidic environments so PH must be >5. Steel Shield™ and Alumi Shield™ warranties are not available if the powder coating is immersed in any liquid. Our dedicated consultants can help simplify the specification process, saving you time and money by providing the right coating advice for your project. On pre-treated architectural aluminium when applied by a Dulux Accredited Powder Coater to the warranty specification on recommended project types and conditions. For more information on our Dulux Alumi Shield™ warranty program click here. On mild steel, bright/semi bright steel, black steel and blue steel as part of the Steel Shield warranty system when applied by a Dulux Accredited Powder Coater to the warranty specification on recommended project types and conditions. For more information on our Dulux Steel Shield™ warranty program click here. Only Dulux Accredited Powder Coaters are able to issue our Dulux Alumi Shield™ and Steel Shield™ warranties after demonstrating their capability to meet stringent quality conditions and international standards.